ADIRONDACK SCENERY is spectacular! In a setting of the highest peaks of the wilderness, Big Tupper is not isolated. Just outside the friendly town of Tupper Lake, where there are ample accommodations for skiers, it is within easy driving distance of other nearby resorts and ski centers. And your comfort at the base of the mountain is not neglected. A modern, spacious lodge houses a skiers cafeteria (open for breakfast), lounges, fireplace and a very well stocked ski shop with a complete equipment rental department. SKI SCHOOL is also and important part of a ski resort operation. A glance at the action pictures on this panel will give you an idea of the caliber of the certified Big Tupper instructors. If you are a beginner, instruction is a must! And even proficient skiers will profit by a little brushing up on technique. 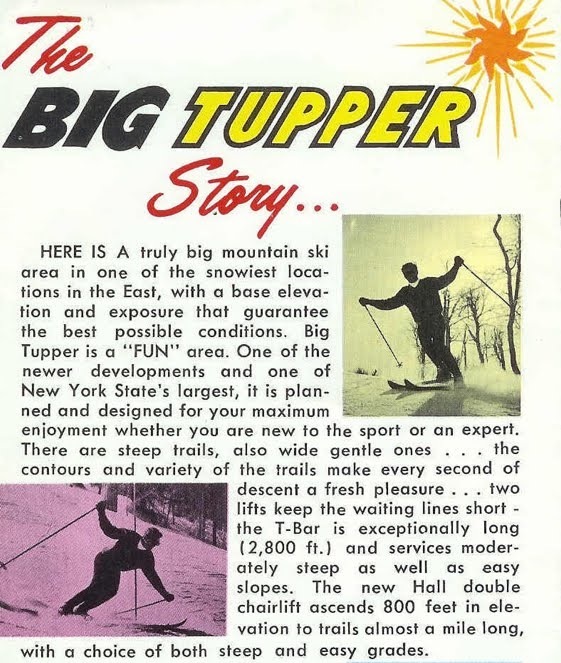 COME TO BIG TUPPER where skiing is really FUN! FOR INFORMATION on lodging or Ski-Week package, etc write or phone Tupper Lake Chamber of Commerce, Tupper Lake, NY 359-3328….for ski information phone Big Tupper 359-3651.